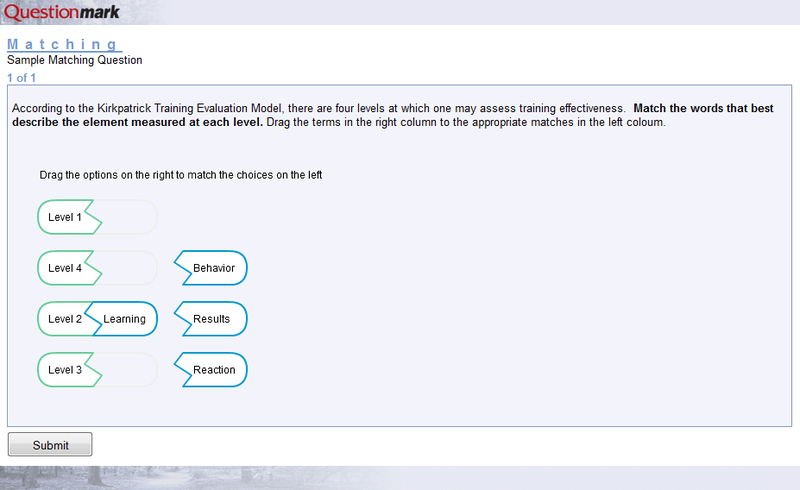 Quiz and test authors need an arsenal of different question types to suit various purposes. Matching questions, which present two series of words or ideas, ask participants to match items from one list to items within the other. Learners must correctly identify which items go together–say, for instance, a state or country and its capital. Matching questions make it possible to measure a relatively large amount of knowledge in a small amount of space, but it’s important to bear in mind that they emphasize information recognition rather than information recall. A matching item in Questionmark Perception might look like the question below. In this example, which uses a graphical presentation format, someone has already started figuring things out! Here’s a quick tutorial on how to create a matching question in Perception, with or without a graphical interface. The tutorial will also show you how to set up scoring and feedback.